This Dieselpunk novel is about Robert „Hitch“ Hitchcock, biplane-pilot of a rather run-down small flying circus who returns to his home town in Nebraska in order to take part in a flying competition that might get him a better paid job with another flying circus. Hitch has one hell of a troubled past with his family and the corrupt sheriff and would rather not return. To make things even more complicated, a mysterious foreign young woman called Jael falls from the sky and onto his plane. Hitch first believes she must be crazy when she demands to take her back home up in the sky —until he nearly crashes into a strange airship with his plane. 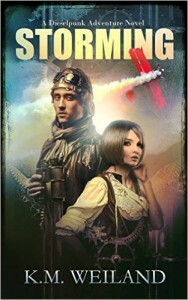 An airship with pirates who have the power to control the weather and demand ransom from his home town, threatening to wreak havoc on the people and their farms. The novel focuses not so much on action – though there are several breath-taking flying and other action scenes as well -- yet more on the character arc, feelings, and motivations of its protagonists. It is narrated in two different perspectives, from Hitch's viewpoint and that of Walter, an 8-year- old nephew of Hitch who adores the pilot and his plane – as most boys of that age would. The mysterious Jael is a strong, brave and at same time rather stubborn character with a big heart. Of course, Hitch has to deal with all the troubles of his past and the present over the course of the story. I'd recommend the novel also to any fan of historical 1920s aviation. 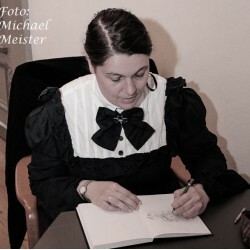 The book has also some simple outline illustrations, especially depicting the Dieselpunk elements.